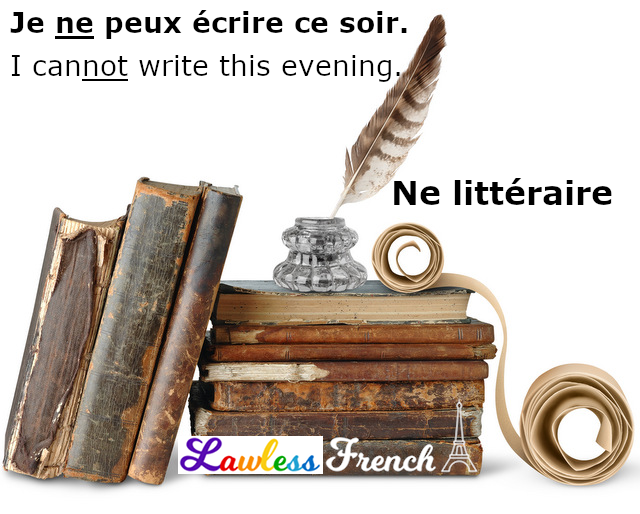 In formal, usually written French, there are certain verbs and constructions that can be made negative with just ne – the inclusion of pas or some other negative word is not required. 1) Cesser, oser, and pouvoir never need pas and are commonly used without it. Vous ne cessez de vous plaindre ! You never stop complaining! Je n’ose leur dire la vérité. I don’t dare tell them the truth. Nous ne pouvons aller à la réunion. We can’t go to the meeting. 2) Bouger, daigner, and manquer can take the ne littéraire, but usually don’t. Alix ne bouge avant midi. Alix never moves before noon. Il n’a daigné y assister. He didn’t deign to attend. Elle ne manque de positiver. She doesn’t fail to think positively, to look on the bright side. a. When it means "to be uncertain"
Je ne sais si c’est une bonne idée. I don’t know if it’s a good idea. Je ne saurais vous répondre. I’m afraid I can’t answer you. Je ne sais quoi dire. I don’t know what to say. But savoir can’t use the ne littéraire when it means "to know a fact" or "to know how to do something." With those meanings, it needs pas. Je ne sais pas l’heure. I don’t know the time. Je ne sais pas conduire. I don’t know how to drive. The ne littéraire is also allowed in three other constructions. On ne le fera si tout le monde n’est d’accord. We won’t do it if everyone doesn’t agree. Il commence à 19h, si je ne me trompe. It starts at 7pm, if I’m not mistaken. Qui n’aimerait voyager à Tahiti ? Who wouldn’t like to travel to Tahiti? Que ne ferais-je pour vous ? What wouldn’t I do for you? Il y avait deux mois que je n’avais dîné en ville. I hadn’t eaten out in two months. Voilà un bon moment que nous ne nous étions vus. It had been a long time since we’d seen each other. En aparté: There’s another ne that lives without pas: the ne explétif. Seen on buses in Ottawa: “L’agression … ne sera tolérée.” Is this the literary ‘ne’? I have seen similar signs elsewhere with ‘pas”; the meaning is obviously the same. Are you sure it’s not Aucune agression …? I’ll ask a native speaker, but I don’t think that’s correct as you’ve typed it. For ‘savoir’, example 3c, should it not be ‘que’ with the ne littéraire, “Je ne sais que dire.” and ‘quoi’ with the regular negation “Je ne sais pas quoi dire.”?